Not much to report on the Action Figures front right now. I received a new batch of editing notes earlier this week and plan to go through them tomorrow or Sunday, and that’s about it there. 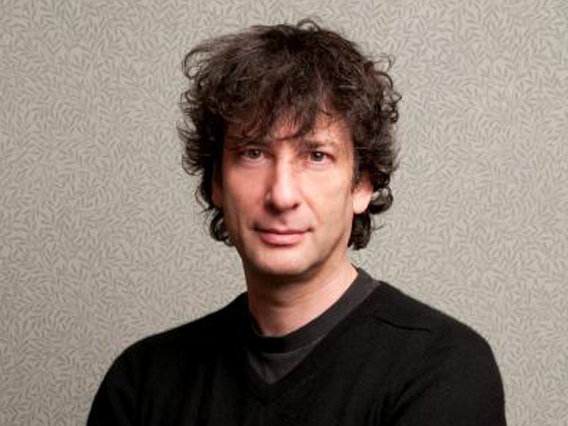 Saturday I get to spend part of the afternoon with none other than Neil Gaiman, who will be holding a talk at Boston’s Museum of Fine Arts entitled “Myth, Magic, and Making Stuff Up.” I am beyond excited to be attending this. I’ve been to one of his book signings before, in Cambridge, during his Anansi Boys tour, and he was funny and charming, and after he signed my copy of American Gods with what he deemed the worst signing of the name “Michael” ever, he apologized profusely and made sure my name was very tidy when he signed my wife’s copy of Anansi Boys. The man himself. Image gakked from the MFA website. I am oddly proud to own a book signed with one of his less graceful inscriptions. Anyway, book signings are one thing, but to attend a dedicated lecture on the craft led by Neil is thrilling beyond words. I don’t care if he doesn’t answer questions, mine or anyone’s, or if he doesn’t stick around to say hello to people personally, I just want to sit there and soak up whatever he has to say. I want to learn from someone whose work I love and, in a way, has served as a long-distance (and unknowing) mentor. Through his blog I’ve picked up on some interesting and valuable lessons about the process of writing that have helped me immeasurably. Best example off the top of my head: back when he was working on The Graveyard Book, he wrote one day how he was stuck somewhere in the middle of the story, and how middles tend to confound him. The beginnings of a story were easy, he said, because that’s when you’re laying down your ideas and introducing characters, and endings, while intimidating, were about bringing all the pieces together and reaching the climax of the creative process. Middles, however? That’s when a lot of stuff has to happen to connect the Point A of the beginning and Point B of the ending, and drawing that line isn’t as fun or easy. As it happened, I was in the middle, literally, of my Bostonia manuscript, and having a mother of a time getting through it. I knew important stuff was happening, but writing the middle third felt way too much like work. The words didn’t flow. The ideas didn’t flow. I worried something was seriously wrong, that my creative mojo was suddenly gone, or that the story was revealing itself to be a dead end and I would never finish it. I didn’t know struggling with the second act was not unusual…not until Neil said so. It took a long while — several months, in fact — to get through that rough patch, but after reading Neil’s blog post, I stopped freaking out about it. I’d work on it as much as I could, until I felt I hit a roadblock, then I’d walk away, let the manuscript sit and let the story percolate in my head for a while, and hit it again when I was ready. If I get even ten seconds to speak to Neil directly, I plan to use the time to thank him for his advice. I know he’ll have no idea what I’m thanking him for, but I’ll know. Good enough.